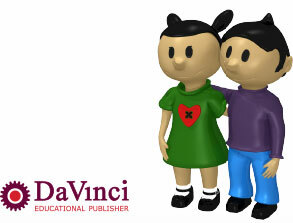 Davinci Education publishes integrated materials for primary schools. Integration of subjects, within the team, and within the school. DaVinci is founded in 2001 and is the result of a rising interest for thematic education for Science and History. One of the basic assumptions is applying norms and values in primary schools with respect for neighbours, nature, and the earth. DaVinci strives for high quality materials. We want to strengthen teachers, children, and the school surroundings and we do that together. Davinci Education focuses on long-term development. We work together with universities, companies, and cultural institutions to achieve high-quality education. High-quality education suitable for everybody while respecting and nourishing talent, intelligences, and ambitions. We are decisive, daring, and original. DaVinci supports the development of talent, promotion and exchange of knowledge, trainings, and seminars as provided by the DaVinci Academy. DaVinci values people, planet, and profit and, therefore, DaVinci is a member of the Pact Maatschappelijk Verantwoord Ondernemen (Pact MVO). Additionally, the curriculum is adapted for Cosmic education with digital school boards, mind maps, and 21st century skills as well as for Christian education (‘Together on earth’). At present, only the curriculum DaVinci is accessible for international use. We are also working on a Spanish version. You can see an example here: Los Egipcios(Pilot).